Twenty Series 63 Practice Questions. Do you need to take the Series 63 exam? Do you have limited time to study? If you answered "yes" to both of these questions, then youve come to the right place! Officially known as the "Uniform Securities Agent State Law Examination," the Series 63 exam is often a requirement to become a securities agent. The examination, developed by NASAA, tests candidates knowledge of state securities regulation. The Series 63 exam is administered by the Financial Regulatory Authority FINRA. The Solomon Exam Prep Series 63 Lite BlackBerry app offers 20 practice questions from the same topic categories and in the same proportions as the actual Series 63 exam: 30% Registration of Persons 25% Securities 35% Business Practices 10% Administrative provisions and other remedies The Solomon Exam Prep Series 63 BlackBerry Lite app is twenty questions long. Each question is followed by an immediate answer and explanation. Users may pause at any time and resume at the same point later on. 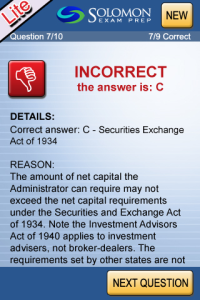 At the end of the quiz, users receive a score and a pass/fail grade. Please see the Solomon Exam Prep Series 63 BlackBerry app for practice exams that are 65 questions long and simulate the actual exam experience. For additional resources and free online tutoring go to SolomonExamPrep.Com. Our other available apps include: Series 6, Series 7, Series 65, and Series 66.